SOS Children's Villages has been working with children and their families in Pakistan since 1975. 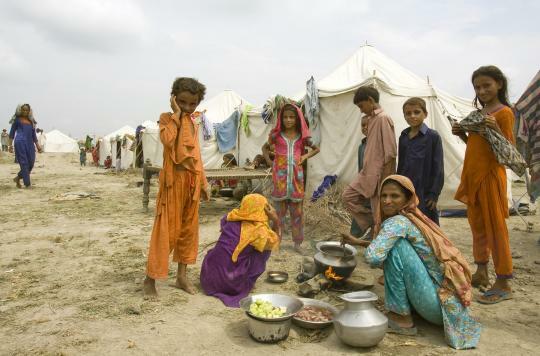 As a result of natural disasters, political unrest, as well as civil war and military disputes in the various regions, the people of Pakistan have been exposed to a life of great social misery, which has affected children in particular. SOS Children's Villages has provided permanent support in the form of health care, education and counselling to families in need. 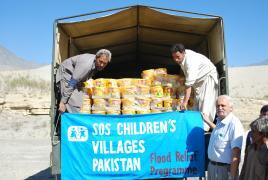 In addition, when natural disasters have struck, SOS Children's Villages has provided Pakistan with relief aid. At present, there are ten SOS Children's Villages in Pakistan, six SOS Youth Facilities, six SOS Hermann Gmeiner Schools, five SOS Vocational Training Centres, five SOS Social Centres, one SOS Medical Centre, and two SOS Emergency Relief Programmes. Two SOS Children’s Villages and one Hermann Gmeiner school are under construction. Pakistan is one of the most populous countries in the world with a population of around 187 million (July 2011 est.). The capital city is Islamabad, which is home to over 900,000 people. The present day Republic came into existence in 1956, nine years after the area gained independence from the British Empire. In 1971, the area known as East Pakistan became Bangladesh. The decades that followed partition saw periods of military dictatorship interspersed with civilian rule. In addition, violent conflicts within the national boundaries and in neighbouring countries have added to the political and social instability. The people of Pakistan face numerous problems, which include poverty, illiteracy, poor access to health care, corruption and terrorism. About a quarter of the population lives under the nationally-established poverty line, with rural areas and areas of conflict being the poorest. Agriculture continues to play an important part in the Pakistani economy. However, recent reforms have increased the role of manufacturing and the financial service sector. Although the economy had been growing in recent years, it slowed down in 2008-2009, and the unemployment figure rose to 15 per cent in 2011. Shortages in the electricity supply resulted in industry shutting down as well as food and fuel prices rising, which led to street protests. Economic development is further hampered by natural disasters and military conflicts. On 8 October 2005, northern Pakistan experienced the most debilitating earthquake in the country's history. According to government figures, approximately 73,000 people died, over 2.8 million were left without shelter, and about 2.3 million were without adequate food. Another natural disaster struck in 2010: Pakistan suffered the worst monsoon floods recorded in its history, which destroyed livelihoods and affected more than 20 million people. It is estimated that over three million people have been displaced by the conflicts in north-west Pakistan. Further conflicts in Kashmir and Punjab have caused additional human misery. In 2001, military action in neighbouring Afghanistan caused millions of refugees to flee across the borders in search of safety. It is estimated that over a million refugees are still in the country. Life expectancy and literacy rates vary according to region, gender and age. In general terms, Pakistan has both a low literacy rate and a low life expectancy rate. Men, those who are young, and those who live in urban areas are more likely to be literate than women, those who live in rural areas, and older people. Life expectancy for men is 64 years while for women it is 67 years. There are around 79 million children living in Pakistan. The decades of political turmoil and the aftermath of natural disasters have affected the lives of millions of children. It is estimated that in the 2010 floods alone, ten million children lost their homes and their belongings, and no longer have access to health care and education. Many families simply cannot afford to send their children to school or take them to the doctor. Poverty forces children to go out to work. Often, children who have moved to urban areas with their families are found working - selling goods or shining shoes - on the city streets. Only 63 per cent of Pakistani children finish primary school; most of these live in urban areas. Girls are less likely to attend or finish school than boys, and their education often suffers further due to early marriage. Before the 2010 floods it was estimated that one in three girls was married before they reached the age of 18. The post-flood number is believed to be higher. SOS Children's Villages meets the needs of children and their families in 12 locations in Pakistan. When children can no longer stay with their families, they can find a loving home in one of the SOS families. Since the illiteracy rate remains at a high level in spite of concerted efforts on the part of the government, the SOS Hermann Gmeiner Schools make an important contribution to education in eight locations in Pakistan. Young people can attend vocational training courses which focus on preparing them for a working life as car mechanics, electrical engineers or plumbers to give just a few examples. While they attend vocational training or higher education, they can stay at special houses provided by SOS Children's Villages. There they are guided on their path to an independent life with the help of professionals. Health care and support for families at risk are an important part of SOS Children's Villages' work in Pakistan. Social centres are staffed with people who are able to assist local communities and specialist medical staff is at hand to deal with medical issues. In response to natural disasters, SOS Emergency Relief Programmes have provided the victims with food packages, medicines and tents, as well as helping them rebuild their lives.